Its hands-off business model makes eBay more profitable than Amazon, at the expense of slower growth. There are lots of ways to make money online by participating in, or facilitating, e-commerce. Auction bidding pioneer eBay (NASDAQ:EBAY) has a business model that, in contrast to Amazon's (NASDAQ:AMZN), doesn't involve competing with sellers who use its platform. eBay also takes a far less active role in sales transactions by leaving things, like shipping and fulfillment, mostly up to the seller. This approach has resulted in slower sales growth for eBay than for companies like Amazon and Wal-Mart (NYSE:WMT). But it also means much stronger profitability and cash flow for shareholders. eBay provides a platform that facilitates transactions between buyers and sellers. Whereas a retailer like Wal-Mart makes money by selling a product that it has purchased at a higher price than it cost to procure, eBay's approach is far less involved. The company doesn't take ownership of the merchandise, so it generates profits through fees it charges sellers in exchange for helping them do their business. Seller fees made up $7 billion of eBay's $9 billion of revenue in the most recent complete fiscal year. (The rest came from advertising income on its websites). These seller fees are powered by two core operating metrics -- gross merchandise volume (GMV) and transaction take rate -- which shareholders follow closely. GMV is the value of all the transactions eBay facilitates, and it's a figure that investors hope to see rise over time. GMV last year was $83.8 billion, which marked a 3% increase over the prior year. By comparison, Amazon logged $95 billion of product sales last year, for a 19% improvement, year over year. eBay's growth sped up a tad in 2017, as a more streamlined website helped push GMV higher by 8% in the third quarter for the company's best growth rate in over three years. Take rate, or the percentage of the final sales value that eBay charges its sellers, is the other key component of fee income. That figure was 7.7% in the core marketplace business last year. The take rate has dipped in each of the last two years to come in a bit below 2014's 8% mark. However, eBay's ticket-selling business, StubHub, benefits from a higher, and rising, take rate, which has offset the dip in the marketplace business. StubHub's 21.8% take rate last year represented an increase of 1.5 percentage points, and helped the company keep rate hold roughly steady at 8.4%. Because eBay doesn't have huge shipping, fulfillment, and product-procurement costs, a bigger chunk of its sales can flow directly down to the bottom line. In fact, the $1.6 billion in earnings it has generated so far this year translates into a 23% profit margin. Meanwhile, the comparable number for both Amazon and Wal-Mart is below 5%. eBay's operations gush cash, too, with free cash flow last quarter amounting to a whopping 30% of sales. 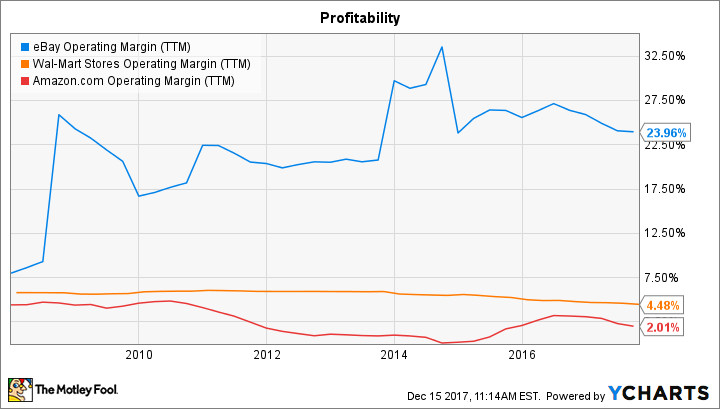 EBAY Operating Margin (TTM) data by YCharts. The key question for investors is whether those impressive financial returns outweigh the risk that eBay loses market share to its bigger, vertically integrated competitors. That seems to be happening, given that Amazon's sales volume growth was 20% last quarter compared to eBay's 8% increase. Wal-Mart's 50% spike also trounced the marketplace specialist's recent results. Still, if eBay can keep core metrics like GMV and take rate moving in the right direction, I expect shareholders to continue earning a mix of healthy cash returns and modest, but market-beating, stock-price gains.